BIRMINGHAM, Alabama -- Galli Cribbs was a little surprised when the Southern League asked him to fill a spot in the All-Star Home Run Derby on Tuesday night at Regions Field. The circuit needed someone to fill in after Jake Gatewood dropped out of the midseason classic and dinger-hitting contest. The Brewers No. 17 prospect leads the league in homers this year with 13 for the Shuckers, but suffered a bruised left wrist last week when he was hit by a pitch. Gatewood's replacement doesn't profess to be a power hitter --- and at 6-foot,170 pounds he doesn't look like one --- but Cribbs is having the best offensive season of his five-year Minor League career. 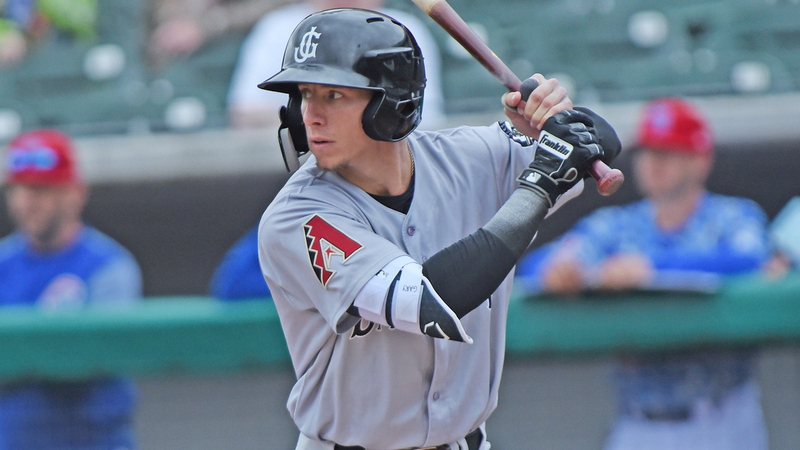 In his second year with Double-A Jackson, the Arizona infield prospect has a career-best slash line of .258/.378/.421 with three homers, 21 RBIs and 54 total hits. Cribbs muscled just one slow pitch out of park during the Derby, but sitting in the dugout after Birmingham's Zack Collins captured the competition's crown, the shortstop let the accomplishment of making his first All-Star Game soak in. "You can take a deep breath," he said. "It's working out now. It took a little pressure off." The 25-year-old is finally getting some recognition. For first-round picks, players from Power 5 schools or highly touted prospects, making an All-Star Game may not be a big deal. But for someone like Cribbs, who didn't make his high school varsity team until he was a junior, bounced around three colleges, went undrafted and spent parts of four seasons in Class A, it was particularly special. "I worked pretty hard this offseason and just took everything I did there into Spring Training," he said. "I'm just trying to keep building on what I've learned from the coaches in Jackson and trying to have some confidence and building off that." Long journeys are nothing new for Cribbs. His Italian ancestors decided to set down roots near Houston. At one time, there was a restaurant in the Texas city called Galli Spaghetti House that was owned and operated by his great-grandmother. "I ate a lot of pasta growing up," Cribbs said with a laugh. Galli was his great-grandmother's last name, but it became a first name for Cribbs and his father. Like the lengthy family's journey from Italy to Houston, with stops in New York and Galveston along the way, Cribbs' road to professional baseball was similar. He attended two Texas junior colleges, San Jacinto and Clarendon, before landing at Bellevue University in Nebraska. It was there, 14 hours from his home in Houston, that he turned into a pro prospect. No team liked him enough to use a Draft pick, but Cribbs signed on with the Diamondbacks shortly after the 2014 First-Year Player Draft. "It's definitely been a different journey from most other guys," he said. "Listening to everyone's story, everyone is different. There was a lot of watching at the beginning and learning what goes on in pro ball. There's some things I think I was behind on when I first came into pro ball. It humbles you. You realize you're going to fail a lot." This year's journey includes hitting for the cycle on April 18 amidst his best statistical year as a professional. Because of his Texas roots, people assume Cribbs might be a country music fanatic, but the opposite is true. Fans can get a hint when they hear his walk-up song. Fat Pat's "Top's Drop" hit the radio airwaves in 1998, when Cribbs was just 5 years old, but he's remained true to his Houston heritage by keeping the track. The next place it's heard might be Triple-A. And then, if things keep trending that way, perhaps the Majors. But on the heels of his first All-Star Game, Cribbs is just enjoying the journey. Tuesday showed him the sweat, development and hard work can pay off. "It's just all been a process," Cribbs said. "It's cliché, but you just got to keep grinding." Mitchell Northam is a contributor to MiLB.com. This story was not subject to the approval of the National Association of Professional Baseball Leagues or its clubs.